To make the streusel, preheat oven to 350. Line a rimmed baking sheet with parchment. In a bowl, stir together dry ingredients. Add butter; mix on low speed until crumbly. Spread across the pan. Bake until golden at the edges, 8 to 10 minutes. Stir. Bake 3 to 5 minutes longer, until golden all over. Let streusel cool. Increase oven to 375. Put a 3- to 4-quart pan on the stove over medium-high heat. Add sugar and 2 tablespoons of water. Stir and cook until sugar begins to brown, 4 to 7 minutes. Swirling pan occasionally, boil until sugar is golden brown, 1 to 2 minutes longer. Remove from heat, let cool about 30 seconds, then gently stir in pears. Return pan to heat and cook, stirring occasionally, until sugar melts again, 2 to 3 minutes. Add wine, ginger, raisins, vanilla and salt. Reduce heat and simmer, stirring occasionally, until pears are just tender, 8 to 10 minutes. Using a slotted spoon, transfer pears to buttered dish. Stir in butter and cook until melted. Spoon mixture over pears. 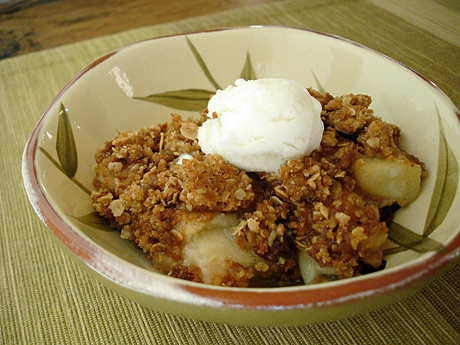 Scatter streusel over pears, then bake until fruit is bubbling, 15 to 20 minutes. Let cool about 10 minutes. Serve warm, with vanilla ice cream, tart frozen yogurt, creme fraîche, Greek yogurt or crema. Make ahead, then reheat in a 350° oven until warm, about 20 minutes. Wow, I have everything on hand except the pears, and those can easily be had. Looks like I’m going shopping tomorrow. Just the thought of pear crisp is making me drool… but pears and ginger!! Heavenly. Love it.